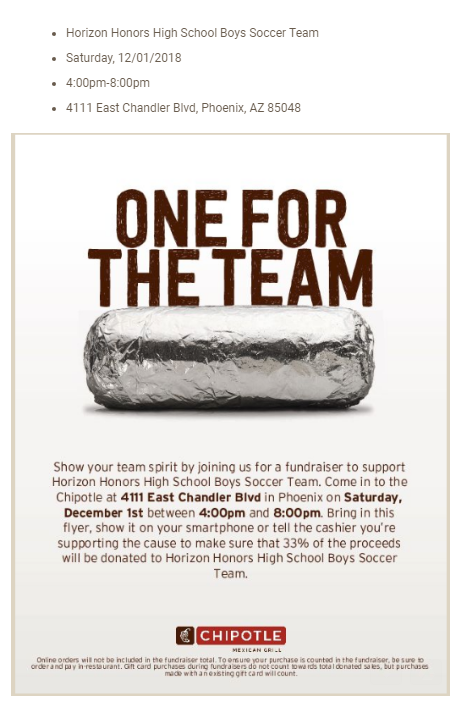 The Horizon Honors Varsity and JV soccer teams are hosting a fundraiser with Chipotle to raise money to pay for uniforms, jackets, and merchandise. 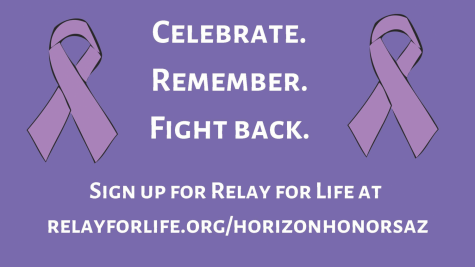 The fundraiser is simple and easy for Horizon Honors supporters to contribute to. The fundraiser will allow not only the varsity team to dress in supportive attire, but also allow the newly added junior varsity team to have their own team uniforms as well. With the fundraiser, the school will be able to keep the junior varsity team alive and supply both teams with needed attire. As a bonus, extra merchandise and t-shirts could potentially be bought with the proceeds as well. On Dec. 1, from 4 p.m. to 8 p.m., all you need to do is go to the Chipotle at 4111 East Chandler Blvd. 33 percent of your total goes to support the Horizon Honors soccer teams. In order for your order to count, customers need to show the employee the following sheet, and tell them you are supporting the fundraiser. The soccer team is grateful for any kind of contribution.